South Africa will unveil updates about its manufacturing sector and business confidence in the week ahead, amid heightened global and domestic geopolitical volatility. The South African Reserve Bank noted in its late March monetary policy statement that global growth concerns and trade have been generally placing pressure on the nation’s economic outlook. South Africa’s economic health faces further uncertainties from its upcoming general elections, in which incumbent President Cyril Ramaphosa's party will seek to retain its majority for a full-term. Meanwhile, certain staples of South Africa’s economy, including its mining sector, have faced mounting challenges in recent years. South Africa is set to unveil updates about its manufacturing sector and business confidence in the week ahead, amid heightened global and domestic geopolitical volatility, as well as an overall slowing of economic growth. The South African Reserve Bank noted in its late March monetary policy statement that global growth concerns, notably in the Eurozone – its key trading partner – along with trade-related impacts on the energy sector, domestic electricity constraints and weakness in business and consumer confidence, have been generally placing pressure on the nation’s economic outlook. While the country’s rate of inflation continues to demonstrate near-term downside surprises, the medium-term outlook appears to have been impacted by higher energy tariffs and rising food and fuel costs. The consumer price index (CPI) for all urban areas year-over-year was 4.1% in February, up from 4.0% in the prior month, and the central bank expects headline inflation to average 4.8% in 2019, before rising to 5.3% in 2020 and moderating to 4.7% in 2021. Meanwhile, producer price inflation for manufactured goods increased to 4.7% in February from 4.1% in January. South Africa’s economic health faces further uncertainties from its upcoming general elections, slated for May 8, 2019, in which the ruling African National Congress – led by incumbent President Cyril Ramaphosa – will seek to retain its majority for a full-term. Ramaphosa in September 2018 had presented a package of measures to stimulate growth, focused on structural reforms, as well as reprioritizing government spending. Fitch Ratings recently noted that a revised mining charter had been approved, lowering uncertainty for the sector, but raising regulatory costs compared with the previous regime. Initiatives also included measures to bolster the nation’s telecommunications, raise competition, reduce bulk transport costs and boost tourism by easing visa requirements. However, Fitch said that the measures “will take time to implement and are not sufficiently far-reaching to raise medium-term potential growth significantly. As a result, potential growth is expected to remain just below 2%,” well-below the historical 'BB' category median of 3.4% and only just above population growth of 1.6%. In early December 2018, Fitch had affirmed South Africa’s sovereign credit rating as a junk status ‘BB+’, with a stable outlook. Certain staples of South Africa’s economy, including its mining sector, have faced mounting challenges in recent years. However, mining jobs have plummeted by around 50,000, or one-tenth of the industry’s workforce, over the past 10 years. Moreover, McKinsey analysis revealed that the productivity of South African mining operations for key commodities has declined over the past five years, even as mining companies in other regions have made rapid gains in productivity. South Africa’s mining operations include key commodities such as iron ore, manganese, and platinum group metals (PGMs), as well as niche commodities such as vanadium and industrial minerals. 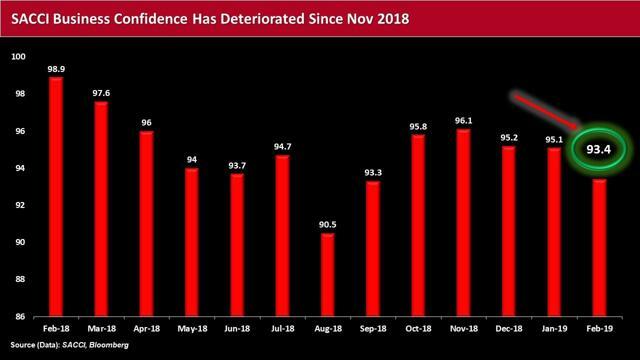 Against this backdrop, the seasonally adjusted Absa Purchasing Managers’ Index (PMI) fell to 45.0 in March from 46.2 in the previous month – the third consecutive month of decline. The latest gauge suggests that demand deteriorated further from the fourth quarter of 2018, which seems to stem from weaker exports, amid a deceleration in global growth – particularly in the Eurozone – while domestic demand conditions also remained poor. IHS Markit will offer another measure of South Africa’s manufacturing industry, after the headline PMI in February rose above the 50.0 no-change mark for the first time in eight months, as output broadly stabilized, and new orders fell at a slower pace. The headline PMI rose to 50.2 in February from 49.6 in the prior month, signaling the first improvement in the health of the private sector since last June. However, according to IHS Markit, while the latest reading marked its fourth consecutive rise, it was still slightly below its long-run average, with new orders still falling. However, Owen added that the return to declining new export orders has “dampened businesses' spirits somewhat. Supply chains faltered slightly as well, with some companies reportedly constrained by raw material shortages. “As such, with elections fast approaching, trade and infrastructure spending will likely be high on the agenda and may be crucial in ensuring sustained growth throughout the second half of the year." 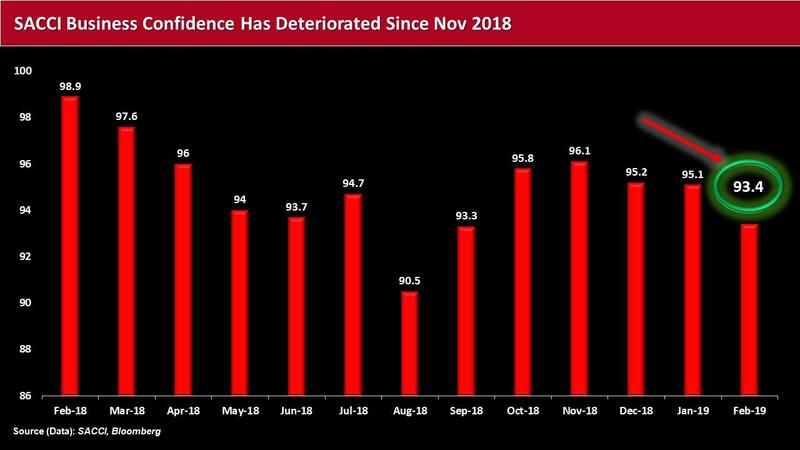 While political risk pervades the country, investors ahead of the weekend will receive fresh figures from the South African Chamber of Commerce and Industry’s (SACCI) Business Confidence Index (BCI). 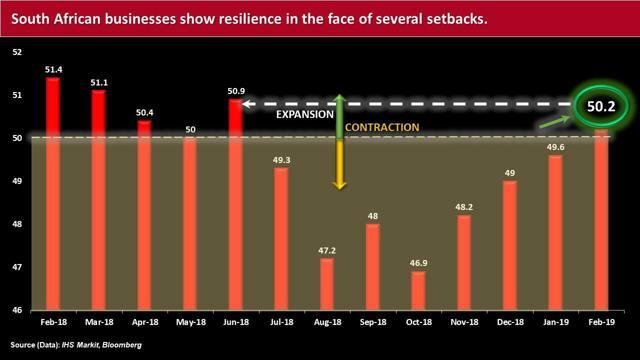 SACCI’s BCI had fallen in February to 93.4 from 95.1 in the previous month, amid ongoing deterioration in business confidence throughout 2018. The SACCI attributed much of the weakness to political uncertainties and past improprieties, noting that “the business climate came to terms with and realized that the structural challenges in the economy lie beyond short-term remedies. “Although action has been taken against some corrupt practices and maladministration, the current preparations by political role-players for the upcoming elections may lead to additional economic policy uncertainty resulting in a tentative business climate” in the very near-term. The SACCI continued that, domestically, the South African economy “faces serious challenges,” which have become “deeply entrenched and need to be handled with urgency and care. South Africa’s challenges at home are further beset by uncertainties that include an unresolved Brexit and its effects on the broader European continent, U.S.-China trade negotiations, capital flows and foreign exchange rate volatility. Still, investors’ perceptions about South Africa’s ability to manage its financial obligations remain somewhat optimistic. Spreads on the country’s five-year credit default swaps (CDS) have tightened by more than 33.5bps over the past three months to just south of 191bps, despite sizable government debt. Fitch Ratings recently said it expects general government debt, including the local level, to rise to 61.1% of GDP in FY’20/21, from 54.6% in FY’17/18. 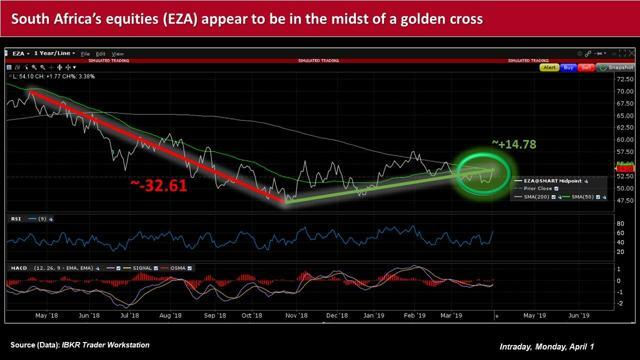 Also, South African equities – as evidenced by the iShares MSCI South Africa ETF (NYSEARCA: EZA) – appear to have recovered somewhat from a steep slump that lasted from April 2018 to September 2018. EZA has gained roughly 14.8% since late September from a plunge of around 32.6% from April to September. 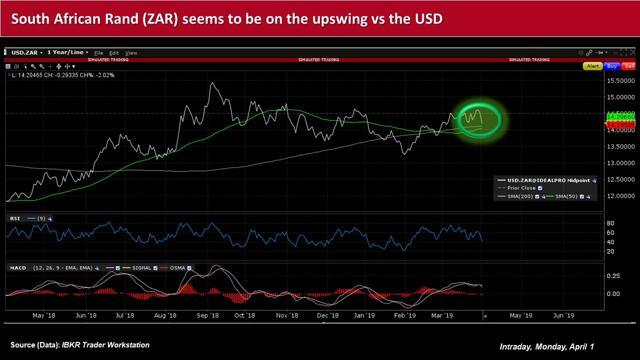 Those investors with a focus on the emerging markets will likely be keeping a close eye on South Africa, as global headwinds and domestic policy and elections continue to shape its landscape. Note: This material was originally published on IBKR Traders' Insight on April 1, 2019.